lz betty memorial bench, Phan Thiet, Vietnam March 2012, "we all gave some but some gave all"
Hannah and I are travelling on a train from Phan Thiet to Saigon. We are travelling gold class in a full air conditioned carriage, this is definitely the way to travel, here are my experiences on this trip with my 19 year old daughter. 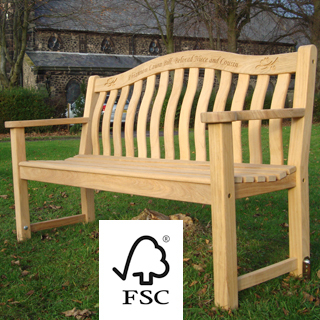 My company imports garden furniture made from teak wood in a factory in Vietnam. 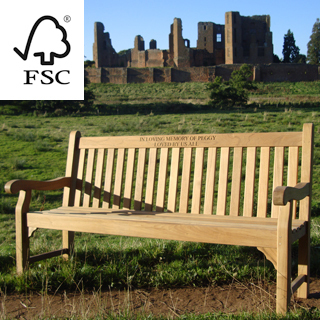 Last year the factory made a sample "Chelsea" memorial bench from which we ordered a container for delivery in March 2011. 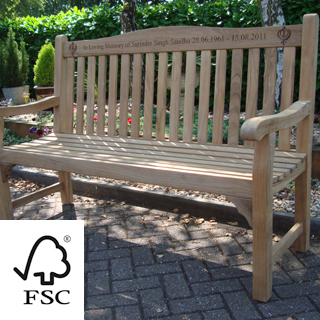 I returned this year to see another memorial bench design to QC it before it was loaded on the container for shipping to England. 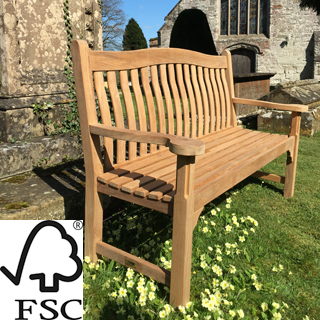 The sample of the "Chelsea" bench was still at the factory and I decided that on this trip I would make good use of it and donate it to somewhere in Vietnam as a memorial bench. 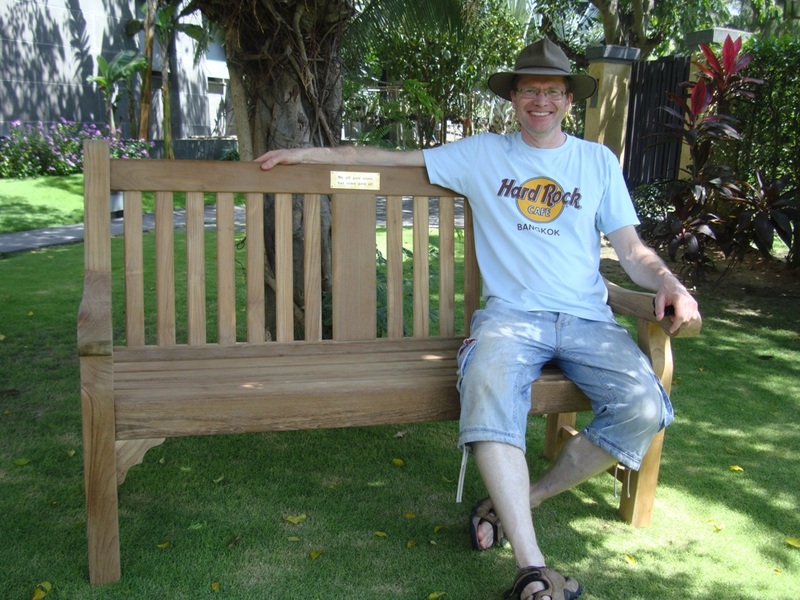 My mission was to find a suitable resting place for my Chelsea memorial bench in Vietnam. On previous business trips to Saigon I have used Bangkok, Thailand as my base, flying in and out for just 2 nights in the city. Vietnam airways have just started direct flights from London to Saigon so this time I decided to combine business with pleasure and spend the whole time in Vietnam, get the business done in Saigon then the rest of the time on a beach nearby without any further flights. Marlena, who runs the office, found the beach area of Mui Ne, 11km north of Phan Thiet, its just 3 1/2 hours by taxi or train from Saigon. Going back to 1969 and some of my earliest childhood memories. Sunday mornings our family would listen to Radio show "Letter from America" by Alistair Cooke. We would be gripped by the accounts from the Vietnam War and the demonstrations in the USA. Words such as Saigon, Protests, Viet Com, Hanoi, VC, Napalm, Hui all stuck in my young mind. However from the constant news reporting, at the time, it seemed like we were fighting the war. Move on 12 years, sitting in the JCR, Wantage hall, reading university, watching "Apocalypse Now". My emotions were given a full workout by this Francis Ford Coppola classic movie. I recall the stunned silence in the room when the credits were allowed to roll until the end. I was 20, the same age as the brave fighting men in the film. Later films such as "The Deer Hunter", "Forest Gump" and the Killing Fields (set in neighbouring Cambodia, filmed in Thailand). The wider world was a dangerous place compared with this peaceful and pleasant of England. In my mid thirties I met an American Prison Guard, on a ranching holiday in Montana. This was an annual holiday for him, but my first time, 8 hours a day in the saddle, evenings found the camp fire, nights under canvas. He was 6ft 6inch giant of a man, big ears which stuck out at right angles from underneath his stetson. His camp fire stories of the Vietnam war were raw and real. He had done 2 six month tours in Vietnam. He put us straight on a few things, he said that British special forces were involved in the Vietnam war, he said that a GI's mission was to get home alive and not to stay and fight until the war was won, many American officers were shot by their own men after being given impossible orders. I got the chance 3 years ago to visit this beautiful country of Vietnam for the first time. I came to visit a factory in the Mekong delta. I fell in love with the people, its food and beautiful countryside. I have been keen to buy from Vietnam since that trip. A month ago I typed "phan thiet us army" into google, bingo. there used to be a US Army base called LZ Betty just SW of Phan Thiet as desribed by Bryan Lagimoniere / Frenchy in his website lzbetty.com, Bryan was a infantry soldier on the base in 1969-1970, he returned in 2005. 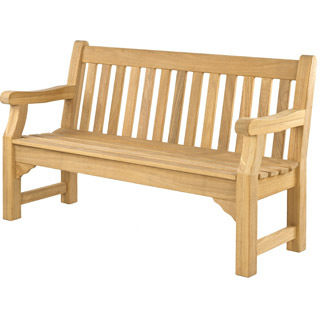 That was it, I would donate our Chelsea Memorial Bench to the men, women and children who died on both sides in the Vietnam War who had connections with Lz Betty. A very prompt response from Bryan confirmed that any wording on the bench must be sensitive to both sides in the war. 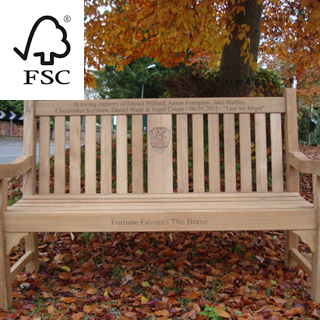 He suggested the wording "we all gave some but some gave all", we have supplied 1000's of memorial benches in the UK but these words really hit the mark I felt. Bryan said that this is a common phrase used by soldiers who served at LZ Betty. 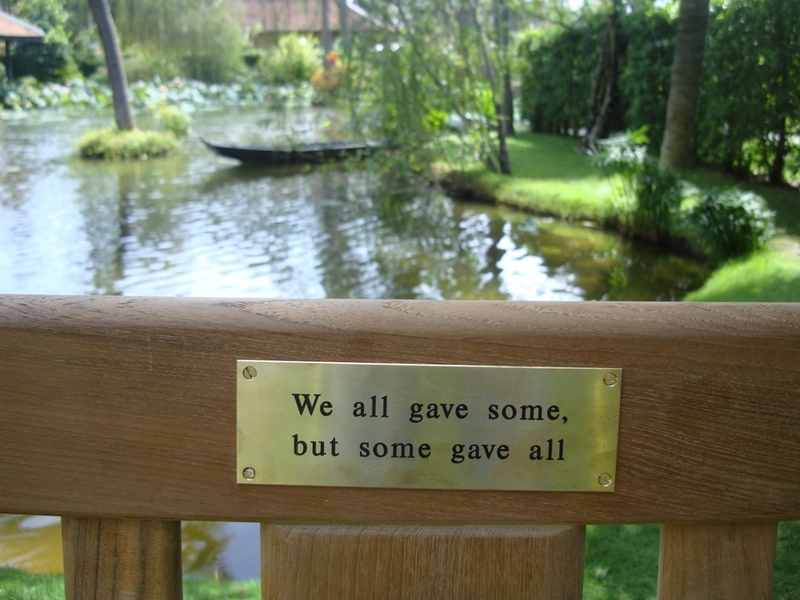 I travelled out to Vietnam with a brass plaque with this inscription ready. The staff at our hotel on Mui Ne beach couldn't have been more helpful. 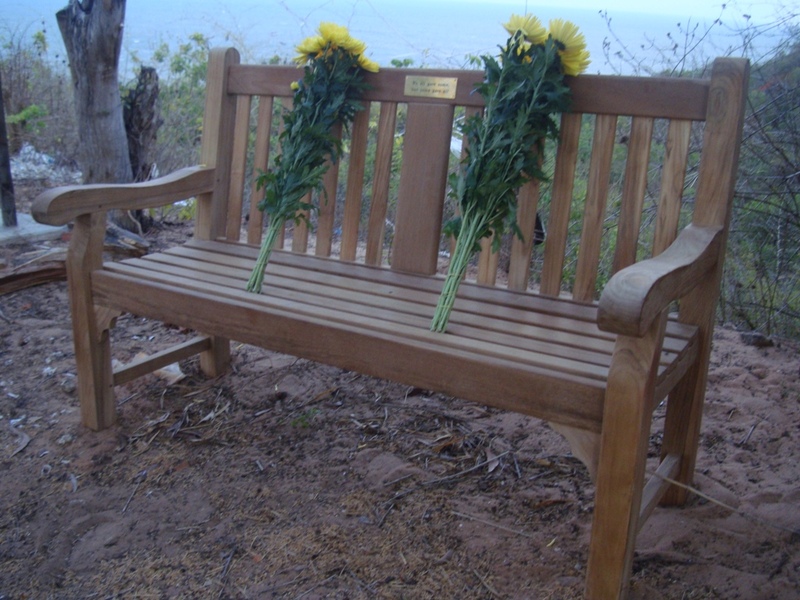 The maintenance crew built up the memorial bench and fitted the plaque, the restaurant manager supplied a bouquet of flowers and was so supportive in the idea, the general manager allowed us to use the hotel minibus and local driver and the customer services manager explained her personal family connections with lz betty. Without out all of their help and support we would not have succeeded. The memorial bench spent one day at our hotel and became a bit of a talking point, an English couple Lez and Kim asked if they could accompany us to lz betty the following day. At 3.30pm on Wednesday 1st march 2012 "Chelsea" was loaded on the minibus with many hands and much laughter, as it was a tight squeeze. From the maps obtained from lzbetty.com and google earth I had planned to access the base from the NE with the sea on our left, but we drove in along a narrow red earth track and arrived at the SW end of the runway. The base is a mess, overgrown with vegetation, buildings gone, fly tipped rubbish and shattered glass on the runway. It wasn't until we had driven the length of the airstrip and reached a large concrete area with the sea on our right, that I realized we had accessed the base from the sw.
Lez was out of the van first like a schoolboy and within a minute was standing on top of an old French build bunker on the other side of a small eroded ditch which opened up into a canyon towards the sea. I got up the plan of the airfield on the iphone and realized our mistake, reoriented ourselves and set off to find the entrance gate pillars. Our guide/driver told us to be careful as there were reports that live ammunition in and around the canyons left by the Americans. 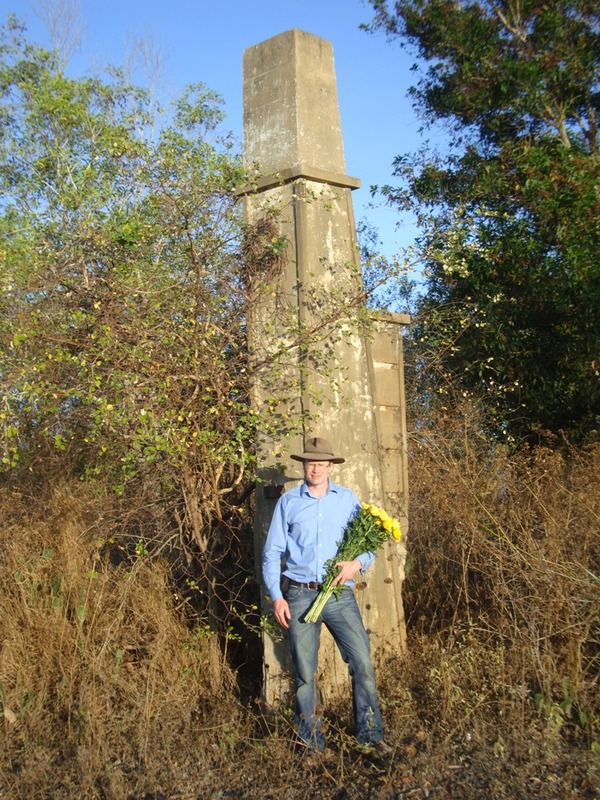 The entrance gate posts remain the one identifying feature still left on the base, 2 30ft high concrete pillars have stood the test of time. 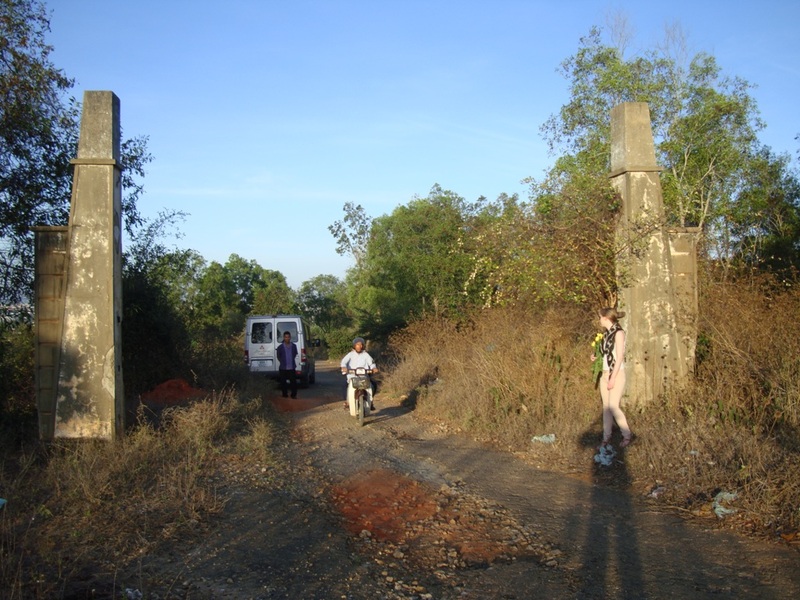 The pillars are 50m NE of the end of the airstrip. Bryan had told me that there was a cemetery NE of the entrance gate, Lez was already ahead of us looking for old headstones. Unfortunately the oldest grave he found was 1974, too late as the assault of the base had taken place in 1970. It appeared that any older graves had been exhumed and the bodies moved elsewhere. We were saddened by this and our aim of leaving the memorial bench in the base cemetery seemed dashed. 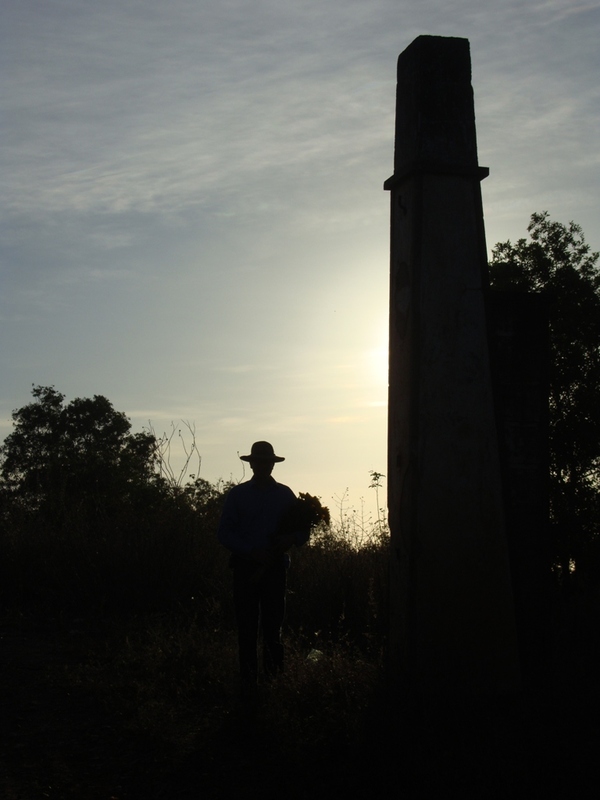 The light was beginning to fade, we had the feeling that if we left the memorial bench at the gate or the new cemetery it would be removed quite quickly. We were about to give up and return to the hotel when a local man appeared. His house was in the original "National Guard & Engineers" compound, as marked on Bryan map. The compound entrance has 2 large wooden gate posts, there is a storage building on the left and a house on the right as you enter the compound. I have to say that the compound smelt awful, the man's business was smashing up shells to make sand for building. 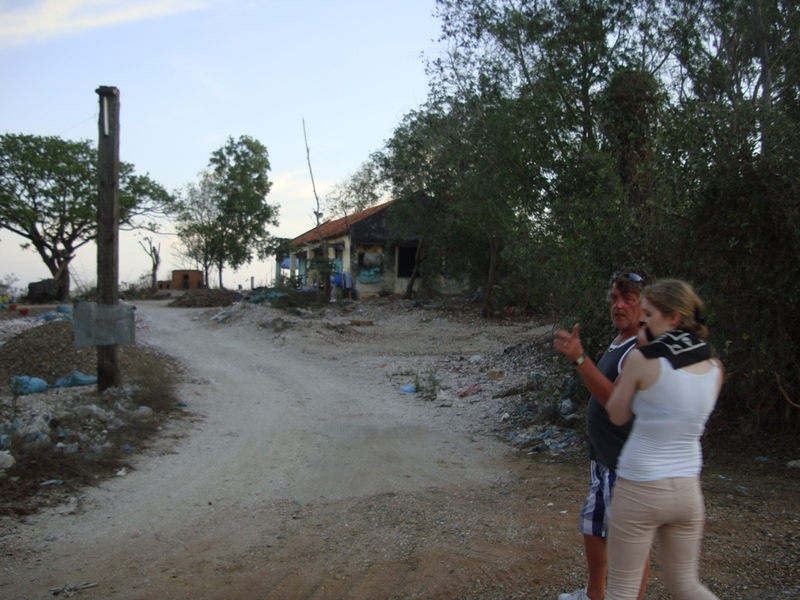 He gestured to us to follow him into the compound and showed us the back where there was an intact French built bunker. To the left of the bunker was an area of flat clear ground after which the ground fell steeply away with a clear view of the sea. That was it for me, this was the place, it was close to lz betty entrance gate and close to cemetery overlooking the South China Sea. 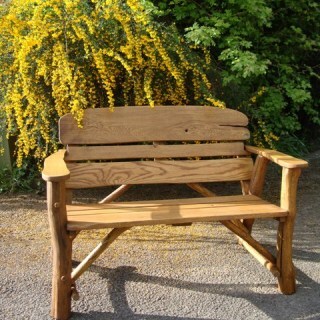 We asked the man if he would look after the bench for us and show it to visitors to which he said he would. As the sun was setting we sat, admired our work and reflected on mission accomplished. I made a promise to our new Vietnamese friend that we would return and visit him again. 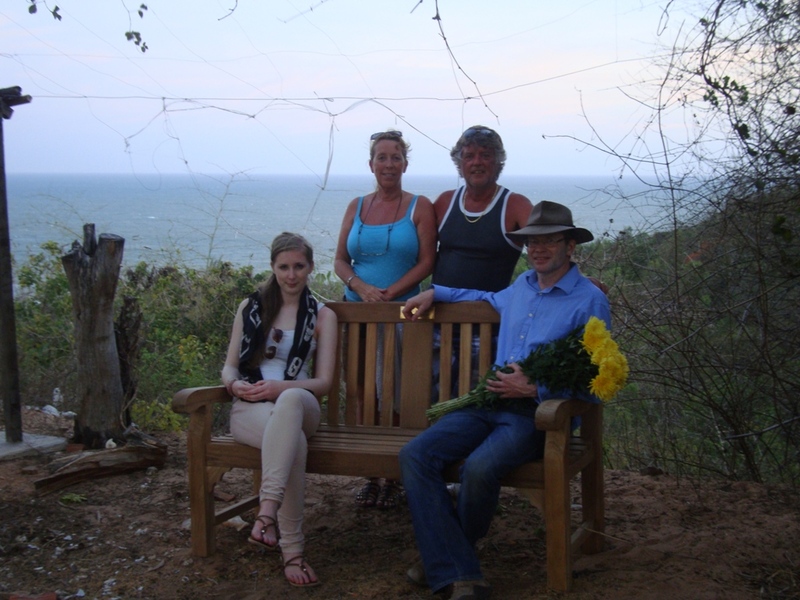 It was dark when we left, no artificial lights anywhere, we drove NE to Phan Thiet, the road took us through very poor housing which we could see where immaculately kept inside, the closer we got to Phan thiet to more motorbikes, then cars until we reached the bustling city. We were all quiet, tied, reflectful and humbled by eventful journey. 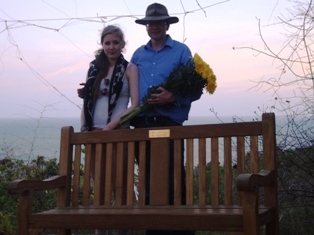 The restaurant manager was waiting for our return, bless her, she wanted to be first to hear how it had gone, we showed the photos of the LZ Betty memorial bench with her yellow bouquet of flowers on, she was so happy as we were. I hope this story will inspire you to visit LZ Betty, sit on our memorial bench and remember "we all gave some and some gave all"